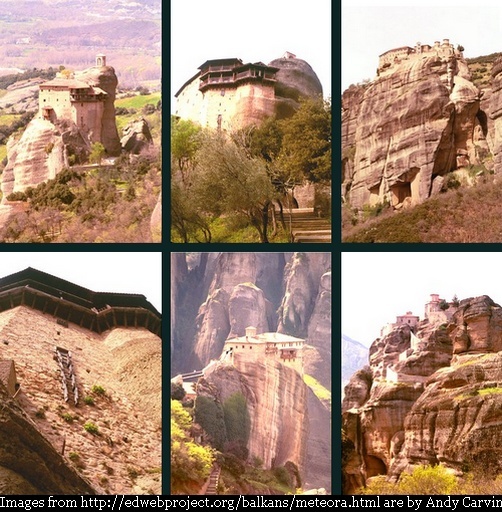 These monasteries located on incredibly high and almost inaccessible sandstone peaks of Meteora in Central Greece were settled by Greek monks from the 11th century onwards. Out of original 24 only six have survived. Till early 20th century access to the monasteries was extremely difficult. Initially long ladders lashed together or large nets were used to haul up, supplies and people, vertically alongside the 373-meter cliff. In 1920s steps were cut into the rock for access from a pedestrian bridge from the nearby plateau. Being a UNESCO World Heritage Site and a great tourist attraction cable car service has also been started now.